Pheasants Forever is celebrating 30 years of its wildlife habitat conservation mission. The most efficient national conservation organization has helped conserve more than 8.5 million acres of habitat for pheasants, quail and other wildlife in the U.S. and Canada. Lightly used. Under 10 times in the field. We've listened to customer feedback to improve our bestselling Strap Vest. 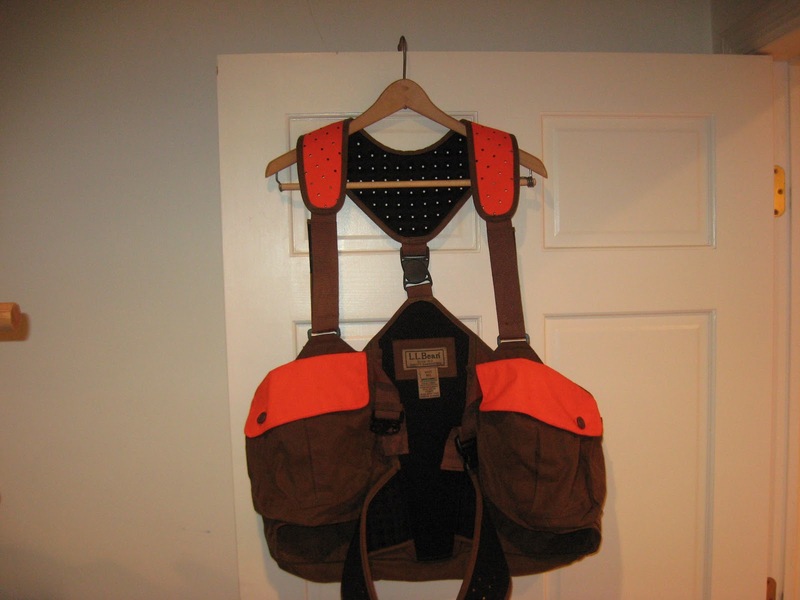 We've replaced the mesh back panel with a single swivel buckle located between the shoulder and the lower part of the vest. This not only increases breathability and cuts weight, it also improves your range of motion when shouldering your firearm. Waistbelt and shoulder harness now feature perforated foam for extra breathability, comfort and reduced weight. 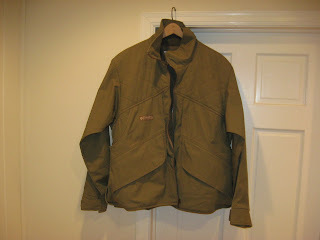 Rugged waxed cotton is water and puncture resistant, lightweight and durable. Game pocket unzips and opens wide for easy cleaning. Roomy bellows pocket over game pocket is ideal for snack, check cord, dog electronics and all the gear you need for a full day of hunting. 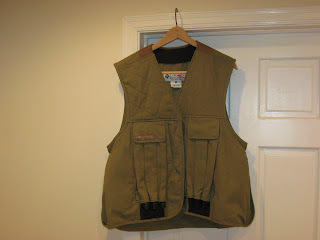 Large front pockets each have four shell loops along with enough room to carry a whistle, spare gloves and other supplies. Wear it in any weather; vest adjusts for comfort over a shirt or light jacket. Imported. I really liked the support that the waistbelt gave. Lightly used. I think I only had this one out 1 or 2 times. Game bag is clean. Fleece liner zips out to let you use it in a wide range of temperatures. 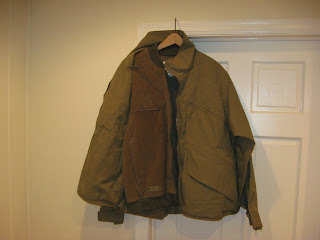 The tag says Medium but I usually wear large sizes for columbia ( and everything else ) and the medium fits me. 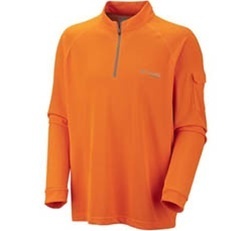 Ideal for quick-changing conditions, lightweight polyester knit has a smooth, silky feel and is both water-resistant and sun-resistant for all-weather comfort. Great worn alone or as a base layer; relaxed fit. My buddy Tony and I set out from the Twin Cities for Webster SD. The reason that we were headed there is that when I looked at the SD map of public places to hunt it looked like it had a lot of options. We have never hunted this area so it is just a shot in the dark. We got to town around 2 pm, checked in to the hotel, got my license, and started out to find a place to hunt. 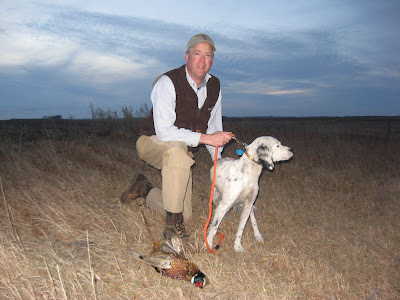 The SD Game and Fish people really seem to have their act together as far as encouraging people to hunt in their state. I was able to download a set of maps to my Garmin driving GPS that showed all the public hunting areas as well as an app for you smart phone that dies the same. We just started driving to a few spots looking for something with good cover. About 12 miles from town we started at our first spot. The dogs started to get birdy relatively soon after our start. They were narrowing in on one area when a rooster decided to try to make its escape. Tony brought it down with one shot from his 16ga. The dogs started to work in a manner that suggested that birds were running ahead of us. We followed them to the thickest cover on the unit. As we entered the cattails a rooster broke wild from the other side. We weren’t able to get of a decent shot but Tina and I decided to head in the same direction that the bird flew towards while Tony and Quetico worked the edge of the cattails. Tina and I hit the fence on the far side and started to work along the harvested cornfield. As we got about half way down the line Tina locked up hard and I moved in front of her. About 20 yards up the line I put up a hen. A few minutes later as I came over a small rise I was able to watch Tony work to the front of Quetico and was able to bring down his second rooster. We made our way back to the truck without any more contact with birds. We loaded up and followed the Garmin from spot to spot looking for another area with good looking cover. After about 10 more miles we hit a group of public hunting areas that covered a fair amount of area. As we got out of the truck a rooster flushed and flew across the road. Tony and I split up and I worked another fence line while he worked the grass. Tina started to point and relocate along the fence and was looking pretty serious about the likelihood of a bird being in the area. Before we could find a bird though a shot rang out from Tony’s direction and he dropped his third bird. Shortly afterwards Tina finally pinned our runner and put up another hen. We made our way around the far side of the field and were on our way back when Tina had a nice solid point on a thick clump of grass and I was able to put up a rooster and took it with an easy shot. It was a first year bird but I was happy we were able to get one for the game bag, I was getting paranoid that I was about to get skunked while Tony filled out. After a short water break at the truck we made it across the road to another section of CREP land. This field had a harvested cornfield along one side that we were working. Tina and I swung left while Tony and Quetico swung right. As they made it across a small section of cattails a rooster got up and Tony again dropped it. Quetico was on it in a flash and make a quick retrieve of it. After putting the bird in his game vest he took a few more steps and a hen came up followed by another rooster that escaped to a thick area of cattails. We continued to work our way back to the truck and each put up another hen. 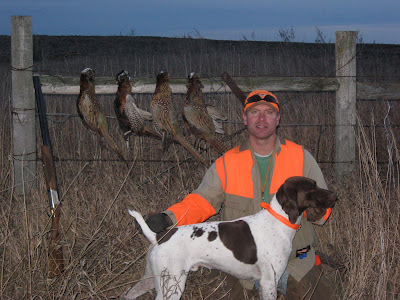 We ended up hunting about 3 hrs on public land and were able to take a total of five birds. We are both hoping that this is the pattern for the rest of our trip.